Gone are the days of when not wearing long veils came with frowns & tut-tutting from the guests. The dawn of rebellious brides brought about more than one way to wear or define a veil. Now, more than ever, we're so glad that there are so many fashionable choices. 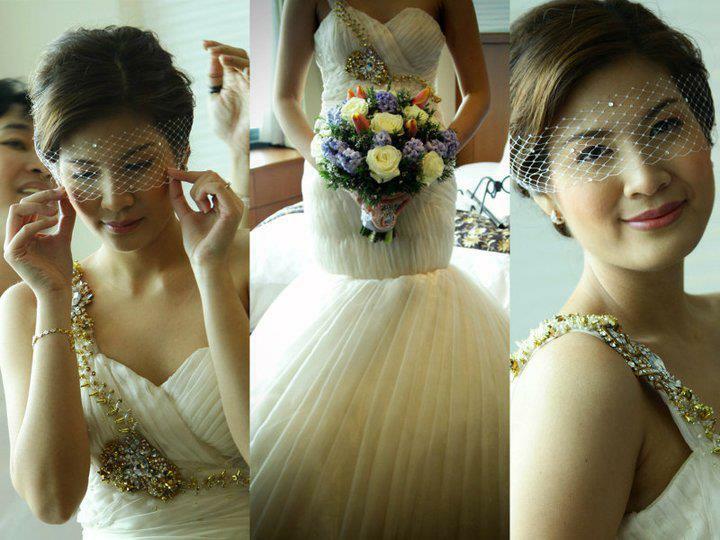 Enter Tiara by Tracy Dizon with two brides and their very personalized "veil." "The Bride is Pinky Reddy-Tuason. She is half Indian and half Filipino married to Jerome Tuason. She is one of my good friends and former models. It was a mixture of an Indian and Greek inspired garden wedding. I took the inspiration from the 'Indian bride who is fully covered-up with in a veil that only shows the eyes' and I thought to modernize it and turn the idea in a completely different way since the bride is very modern and open to fresh ideas. We came up with the swarovski strip net with a gold diamond hair brooch accent at the back of the veil." "I must say that it's always interesting and challenging to collaborate with my good friend and colleague Hazel Santana when it comes to inventive ideas and concepts. This is actually not our first time to make a "Rebellious Bride" happy. 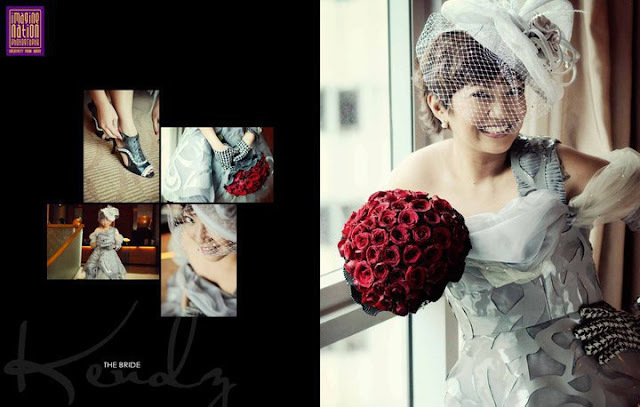 One of my most favorite rebellious bride that Hazel and I collaborated together is Candy Binalay-Estilo and Chat Estilo's "The Union" (October 8, 2010). Chatz and Kends were the most exciting wedding couple I have come to work with. This fierce couple (as Kends' famous email signature tag line say) "A Rockstar cleverly disguised as a Lawyer." They're truly indeed ROCKSTARS in a pricey lawyer suit. This Mod-Ska Theme is soo fab!! I even designed the little ring bearers' newspaper boy hat! So cute! Houndstooth prints, Red and Black and Whites! 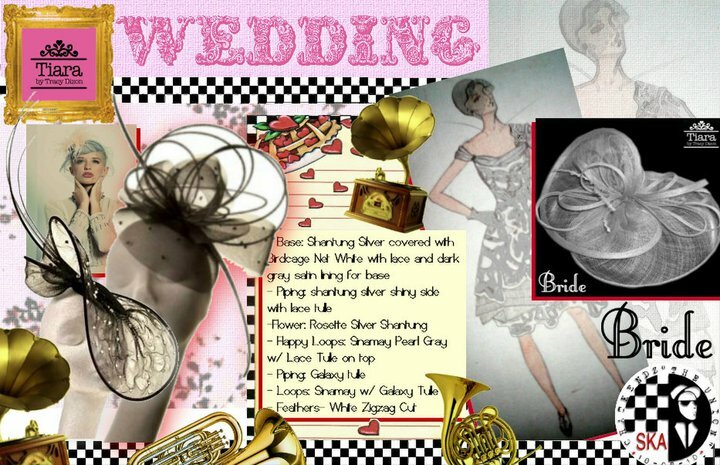 As a past- punkska amateur singer... Chatz and Kends' Wedding is something close to my heart. This is by far the most pinaka-ASTIG na wedding I've attended. They even invited a Pinoy-Ska Band, Jeepney Joyride to play at their reception! Everybody super enjoyed their wedding para siyang naging gig! Candy... is truly a REBELLIOUS BRIDE! She didn't want a typical white wedding gown, she didn't want long girly hair, she didn't want girly floral prints and patterns-- So Hazel designed something so unconventional yet so classy. 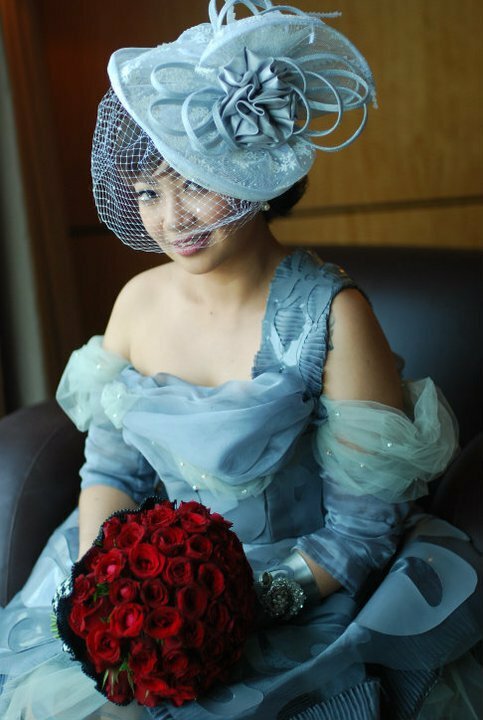 A gray-colored short wedding gown with fierce leather lasercut patterned design. On my end, I was so happy I can go all-out with unconventional -- almost fluid like silhouette of a headpiece... I chose a the most geometric lace pattern I could find and experimented with zigzag feather cuts and loopy flops of the headpiece. What's so awesome is that she totally rocked it! She looked like the queen of her wedding night~ the Punkska Queen!" Two very different brides, two one-of-a-kind veils. What kind of veil did you wear for your wedding? Share it with us if you think it's oh-so very YOU! Stay rebellious, brides! I absolutely adore Candy's headpiece - it is stunning and I would love to wear something similar to that when I get married. Awwww...shucks! Punkska Queen? I love you guys!